VICTORY! Massachusetts voted YES on Question 4, the ballot initiative to tax and regulate marijuana. Read a statement from ACLU of Massachusetts Political Director Whitney Taylor. Learn the facts on marijuana law enforcement. 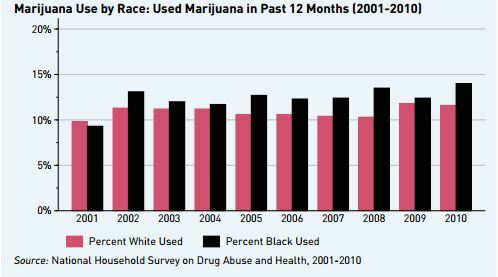 Read the ACLU of Massachusetts report The War on Marijuana in Black and White: A Massachusetts Update (appendix). View an interactive map, created by ACLU of Massachusetts Mozilla Fellow Paola Villarreal (@paw), illustrating the racial disparities in policing of marijuana. Opposition to Question 4 base their arguments on a 2016 report written by a Massachusetts Senate Committee. This government report covers a wide range of important issues, but it is flawed because it contains fundamental inaccuracies and speculative conclusions concerning the implications of regulating recreational marijuana. This rebuttal addresses several of the most important issues pertaining to revenue, teen usage, public health and dependency, racial disparity and driving under the influence ("DUI"). Learn more: Rebuttal to the Report of the Special Senate Committee on Marijuana. The war on drugs has disproportionately impacted communities of color, even though rates of drug use are essentially the same across race. 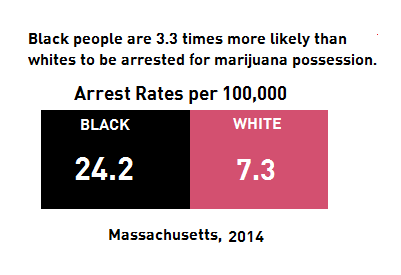 In Massachusetts, Black people are nearly over three times more likely than white people to be arrested for marijuana possession. 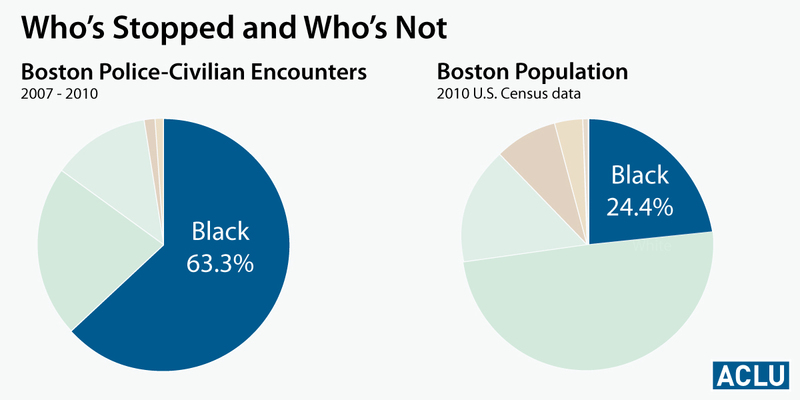 The reason for this disparity is that policing practices target communities of color. The best way to address this disparity is to remove the penalties themselves by passing Question 4. Even though possession of an ounce or less of marijuana was decriminalized in 2008, Massachusetts still sees over 600 arrests annually for marijuana possession. More marijuana businesses in Massachusetts means more jobs for Massachusetts residents and improved public safety. The ballot initiative includes language to promote participation in new marijuana businesses by people from communities that have been disproportionately affected by drug war policies. Massachusetts will see $1 billion in sales through legal, regulated marijuana dispensaries. Dispensaries will increase public safety. Studies completed by the Los Angeles Police Department, University of California Los Angeles, and the University of Colorado all found that dispensaries do not increase crime, but rather have the same impact on a neighborhoods as coffee shops. When dispensaries are placed in areas with little development, they increase public safety because of the security measures, including cameras and guards, that are put in place. Reducing illegal drug sales will increase public safety. Authorities in Colorado estimate that 70% of demand is met through legal sales, significantly undercutting the profits of drug dealers. That’s why cartels in Mexico are finding it harder to sell marijuana in the US, resulting in less violence in our neighboring country as well. Question 4 would generate additional $100 million in tax revenue over the next three years that can be used to pay for substance abuse treatment, education, and other social services. It would also save over $9 million annually in law enforcement funds that will no longer be wasted on investigating, arresting and charging marijuana users. It will not increase youth use. 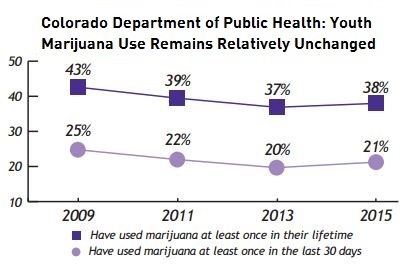 In Colorado, which passed a similar reform in 2012, youth use is down. It will reduce opioid overdose deaths. In states with medical marijuana, overdose deaths decrease, as patients replace their toxic and dangerous prescription drugs with the safer alternative of marijuana. Similarly, access to marijuana can also decrease overdose and addiction for people who use other drugs recreationally, including heroin and alcohol. Marijuana is not a gateway drug. In fact, for many people addicted to opiates, marijuana an "exit drug."